Assassin’s Creed Origins makes the most of its Ancient Egypt setting by let us raid a series of tombs and monuments. It’s really worth your time. The tombs in Assassin’s Creed Origins are among some of the most atmospheric and iconic locations in the game, and well worth a visit just for that even if you weren’t a little obsessed with ticking off the game’s whole checklist as soon as possible. Tombs are also where Assassin’s Creed Origins hides silica, a resource you’ll want as much of as possible for, uh, reasons (spoilers through that link!). On this page we’ve collected a list of every tomb in Assassin’s Creed Origins, plus given notes on those tombs where we ran into difficulties getting in or through them. There will be some slight spoilers on this page, so if you’d rather explore on your own head back to our Assassin’s Creed Origins guide and look for something else to help you out today. Located northwest of Siwa. Activate the Hideaway side quest for directions. Plunder for three silica and three treasures. Break walls and move objects to open paths. Beware hyenas at the exit if on the side quest. In the northwest of the Giza region. Plunder for five silica and six treasures. Dive in the water to find a hidden room. Put five weights on one platform, then use the other to climb to the next area. Northernmost of the two enormous pyramids in the Giza region. The crack by the entrance leads to an Ancient Mechanism, so come back to it. Break two seals in the treasure room to raise floor level with sand. The smaller pyramid in the Giza region. Look for an opening hidden in the wall above you near the entrance. Break the wooden ceiling with arrows to pass through. Located just south of the west fast travel/viewpoint in Haueris Nome. Plunder for four silica and two treasures. Use fire (dropped torch, lit arrows) to open panels in floors. Break seals to raise floor level with sand. Dive into the pool to reach the final room. Moveable object hides quick exit. In the northeast of Saqqara Nome, near a cobra lair. Plunder for four silica and five treasures. Break amphorae with arrows to open paths for moving objects. In the south east of Saqqara Nome. Plunder for five silica and four treasures. 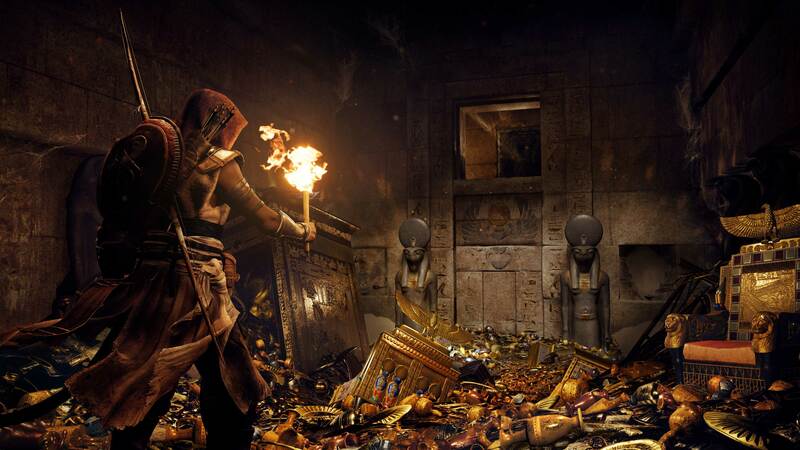 Combine with side quest Rites of Anubis, and complete First Blood while you’re in here. To enter, look for another passage into the pyramid, where you’ll meet some cobras in a seeming dead end. Look up and climb into the tunnel beyond. Break the wall at the far end, then shoot an arrow through to break the amphora. You can then slide the moveable object. Weigh down a platform then jump from a moveable object to proceed. Break objects to open paths – and to remove weight from platforms. Dive into water to reach the final room. In the west of Uab Nome. Plunder for two silica and two treasures. In the far west of the Isolated Desert region, near the Goat Fish Stone Circle. Plunder for four silica and three treasures. Break walls and dive into water to proceed. Then break walls under water! The tombs below contain Ancient Mechanisms and should be tackled in order for maximum story comprehension. North and slightly east of Remetch-Ra village in the Isolated Desert region. Plunder for 11 silica and four treasures. Use mirrors to catch beams of light and mark the correct path. Destroy amphorae and crates to allow light to pass through. Contains Ancient Mechanism #1: Oun-mAa Niye Ressoot. Costs five silica to activate. Located in the southeast of the Black Desert region. Plunder for 13 silica and four treasures. Move the object under the far end of the boat so you can run up it. Contains Ancient Mechanism #2: Seshem.eff Er Aat. Costs five silica to activate. The southernmost of the two enormous pyramids in the Giza region. Plunder for five silica and three treasures. Push the object under the boat so you can run up it. Contains Ancient Mechanism #3: Tomb of Khufu. Costs five silica to activate. On the southeast tip of the peninsula that is Haueris Nome. Plunder for 12 silica and four treasures. Combine with Seven Farmers side quest for maximum efficiency. Break walls and dive into pools to proceed. Place weights on platforms so you can climb the other side. One platform puzzle has no weights; let the far one sink under you all the way, then hop to the platform between them, wait for the other platform to rise right up, then bounce across quickly. Contains Ancient Mechanism #4: Eeyoo Sekedoo Aat Costs five silica to activate. Only point of interest in the Desheret Desert region. Plunder for 15 silica and three treasures. Move and clean (burn) mirrors to allow light to pass. Contains Ancient Mechanism #5: Qeneb too Kah’Aiye. Costs five silica to activate. Found in Giza, near the village by the water. Full tomb is not available until you have completed the Bayek’s Promise side quest. Contains Ancient Mechanism# 6: Eesfet Oon-m’Aa Po. Costs 50 silica to activate.